Welcome to another Becoming A Modern Man! In this article, I am going to be taking a look at the Eldrazi & Taxes archetype in Modern. Eldrazi & Taxes is a variant of the Death & Taxes/Hatebears deck. It uses the powerful Eldrazi creatures and the discount from Eldrazi Temple to power up the deck. 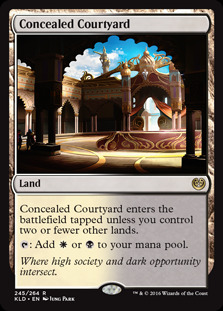 I think we probably want the fourth Concealed Courtyard in the deck but I didn't have one at the time. Thalia is one of my favourite hatebears of all-time. Thalia makes most opponent's life more difficult squeezing them for extra mana to cast their spells and slowing their progress. 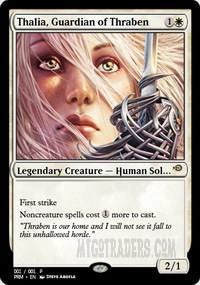 Thalia is very frustrating to play against but as our deck is very creature-focused it hurts us very little. 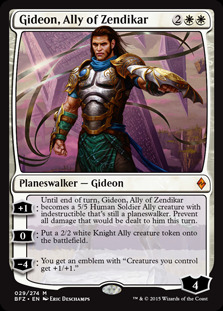 Another cornerstone hatebear is Leonin Arbiter . Arbiter prevents searching unless a player pays 2 to ignore the effect for that turn. 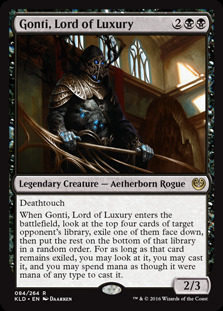 It has some excellent synergies with Path to Exile and Ghost Quarter , allowing us in many circumstances to ignore the part where the opponent gets to search their library for a basic land. Arbiter is very punishing against search heavy decks, such as Tron and Scapeshift , which can be heavily stalled by its effect. Sculler is a powerful and disruptive 2-drop. 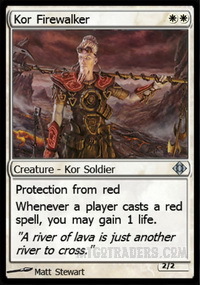 As a 2/2 it has a decent body and taking your opponent's best card from their hand is always going to powerful. Sculler interacts nicely with Wasteland Strangler which can send the exiled card back to the graveyard to avoid it ever returning to the opponent's hand. 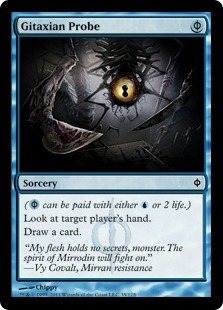 Also, if the card you originally exiled is not as powerful as it was earlier in the game you can blink the Sculler to take a fresh look at your opponent's hand. 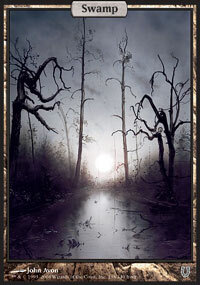 Flickerwisp is another staple of this style of deck. It has to be said that Wisp's effect can be at times underwhelming but at the very least it should be able to untap a land for you. The really exciting part is when it is combined with Vial or Eldrazi Displacer which allows you to use it's ability at instant speed. This can then be used to protect a creature from removal, temporarily remove an attacking creature or remove a permanent at end of turn. Due to the wording of Flickerwisp if you are able to play it on the end step the permanent that is exiled will be exiled until the end step of the following turn. This means you can deprive an opponent of one of their permanents for your whole turn or their turn depending on how you want to play it. You can drop in Flickerwisp at the end of your turn and take an opponent's land to prevent them from casting a particular spell (this can be very effective against Tron). You can drop it at the end of their turn to take away their Leyline of Sanctity while you cast a Thought-Knot Seer on your turn. The possibilities are extremely far ranging. Also, as a 3/1 flyer Flickerwisp represents a real threat in the air, particularly as a lot of decks lack aerial threats. That said the one-toughness does mean that Flickerwisp cannot stand up to much resistance. Lingering Souls and Bitterblossom are unfortunate things to come up against with a Flickerwisp . Displacer is probably my favourite card in the deck. The repeatable blink effect is very powerful and makes combat very difficult for our opponents. 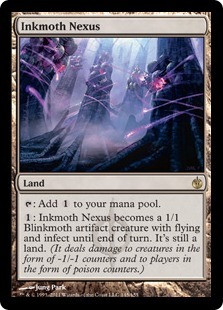 It also does some very powerful things when combined with Flickerwisp and various other creatures in our deck. Displacer really shines in the deck and it's ability is reduced by Eldrazi Temple . Once you can activate Displacer twice you can do some ridiculous things. 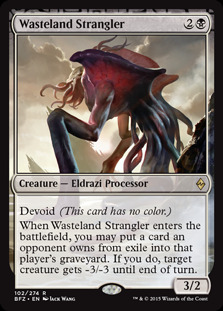 Wasteland Strangler is a card I have had mixed experiences with. 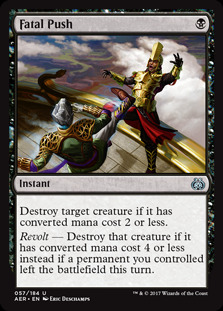 On the one hand, it gives the deck some much needed additional removal in matchups where that is relevant. 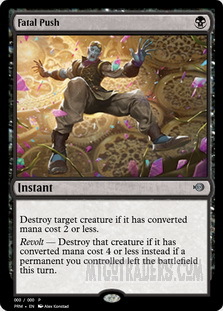 However, the removal element of that card is conditional on being able to return an exiled card belonging from your opponent back into their graveyard. There are a lot of cards in the deck that exile cards, such as Path to Exile , Tidehollow Sculler , Thought-Knot Seer and Flickerwisp (though you will need to play Wisp at instant speed or be able to play them in the same turn), but there is no guarantee there will be a card exiled so you can cast Strangler on curve. There are a lot of great interactions with Strangler, such as removing the card exiled by a Tidehollow Sculler so there is nothing to return when it dies. Also, if you Vial in a Flickerwisp at the end of your opponent's turn you can prevent the card from returning to play. 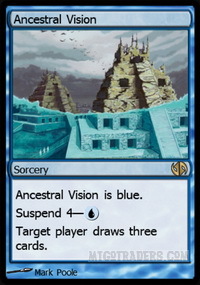 I've also put a Suspended Ancestral Vision into the graveyard before for value. All in all I don't love Strangler as there is no guarantee you will be exiling any cards early to make it a worthwhile play. However, if there is a card exiled then it represents excellent value. 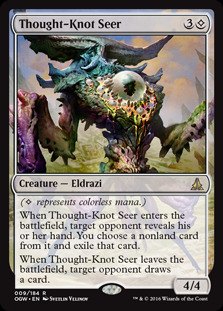 Thought-Knot Seer is a very powerful creature that also combines well with the other disruptive elements of our deck. Seer gives us a powerful creature, which perhaps more than most in the deck is capable of seeing out the game. Blinking Seer isn't quite so good as your opponent will draw a card as it leaves but if your opponent is light on instants you can blink it on draw step to keep control of your opponent's hand. Smasher gives us a powerful top end to the deck and is a nice finisher for the deck. 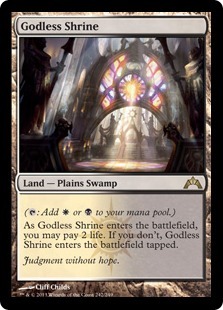 Eldrazi Temple can provide a healthy discount to the Smasher's cost. The decklist I chose is quite heavy on the Smasher running 3 copies, which in my opinion is slightly too many and I would probably cut down to 1 or 2 copies. Smasher particularly shines against other creature heavy decks as the Trample and Haste allows you to hit hard, fast and through blockers. One of the very best removal spells in the format. Path is a great answer to the majority of the creatures in the format. 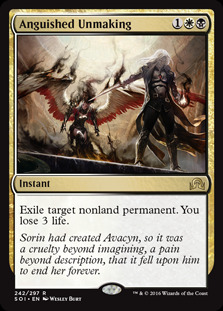 The downside is giving our opponent a basic land but this can be offset by the presence of a Leonin Arbiter on the board. It's easy to underestimate how good is in this deck. A lot of our cards are much better with Vial in play. 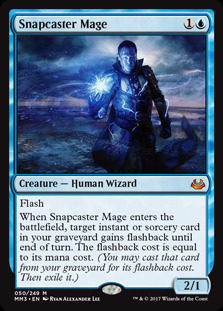 Flickerwisp becomes vastly more powerful at instant-speed and our hand-disruption creatures can be flashed in on our opponent's draw step. 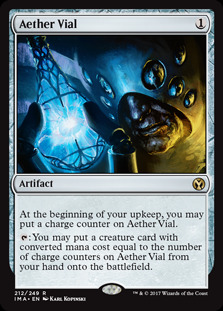 Vial also frees up our mana for things like activations of Eldrazi Displacer . Games where you can kick things off with a Turn 1 Vial tend to go much better than those that don't. That said it it isn't terribly useful in multiples and it's a poor topdeck. 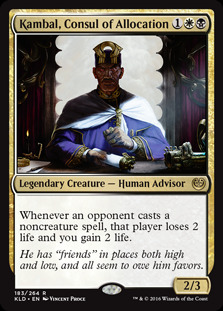 The deck is dedicated to being the best Leonin Arbiter deck it can be so unlike most Modern decks there isn't a single fetchland in the manabase of this deck. 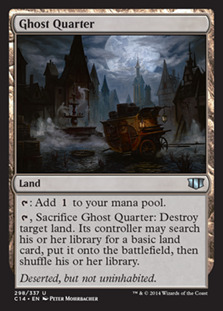 Ghost Quarter is an excellent card in this deck. It taps for colourless mana to let us cast our Eldrazi or activate Eldrazi Displacer and also is an excellent combo with Leonin Arbiter . With Arbiter in play Ghost Quarter can act as a Wasteland which allows for powerful mana-denial. 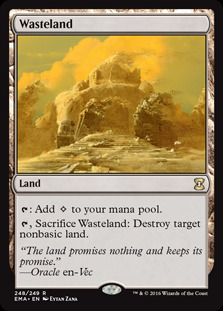 In general, Quarter is a great answer to Tron lands, creaturelands and other problematic lands. Temple strongly supports the Eldrazi-theme of the deck and offers a substantial discount on our Eldrazi creatures and activated abilities. Eldrazi Displacer is a lot more exciting with Temple as you can activate it's ability off of two lands. 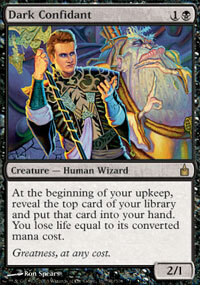 You also get the occasional sick draws where you can cast a Turn 2 Thought-Knot Seer and Reality Smasher . Shambling Vent provides us with a powerful creatureland that also gives us access to both our colours. The lifegain from Vent can help swing races and it is also an excellent blocker. 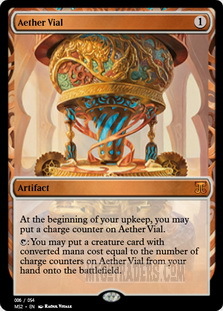 Thanks to AEther Vial we can afford to keep mana up to activate a land like Vent. The duals are important to giving our mana. 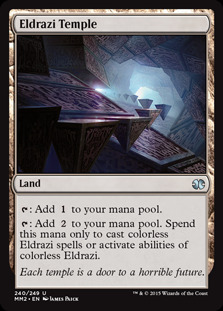 Colourless mana is also important for hardcasting the Eldrazi which makes Caves very important. 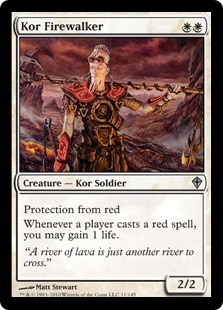 Kor Firewalker is a powerful card against Burn but I am not entirely sure the justification of running 4 in the sideboard. 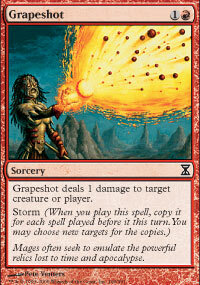 I guess it's also strong against Storm as it makes it much harder for them to kill you with Grapeshot . 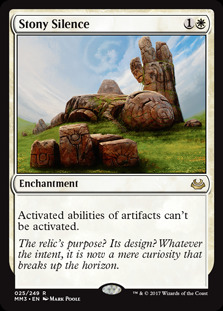 Stony Silence is a powerful anti-artifact card. It's very powerful against Affinity, Tron and Latern Control. 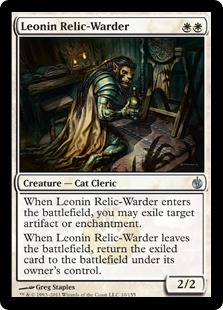 Leonin Relic-Warder is another fairly niche artifact hate card. 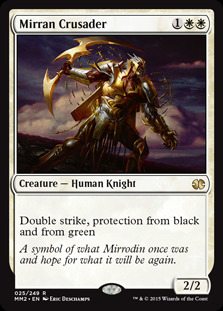 Mirran Crusader is a powerful 3-drop that can come in when some of your cards are redundant. It's also very good against Collected Company decks and GBx decks to attack through their creatures and hit through groundstalls. 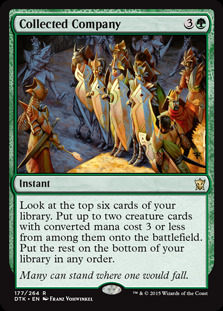 Rest in Peace is a great anti-graveyard sideboard card. There are lots of graveyard shenanigans going on in Modern - such as Dredge, Storm, Delve creatures and Snapcaster Mage s.
Thoughtseize is an addition to our hand disruption suite and is good against the combo decks. Fatal Push gives us additional removal options. 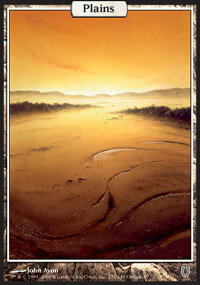 Our deck is removal light which can make matches like Infect problematic. Orzhov Pontiff is a useful way to clear the board or set up an alpha strike. It also interacts well with the blink effects allowing for multiple activations. I start things off with a quick video deck tech discussing the card choices and the general theme of the deck. 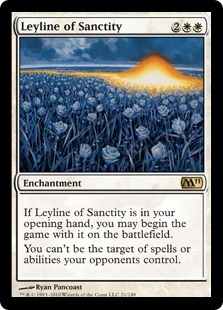 Our first matchup is against Affinity, which has been a Top Tier stalwart in Modern throughout its history. Game 1 can be tough as they can be very speedy which can be a lot for our deck to handle. Post-board we have a lot of good cards against them including Stony Silence and Leonin Relic-Warder . Our second matchup is against Dredge. This is an interesting matchup. 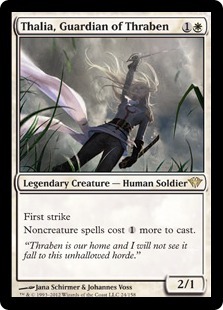 We don't have a lot of graveyard hate maindeck but cards like Thalia, Guardian of Thraben can punish their slightly awkward manabase. Post-board Rest in Peace is a huge game though they do have answers to it. Our third matchup is against Infect. Infect has taken some big hits with the banning of Gitaxian Probe and Fatal Push adding another powerful one-mana removal spell to the format. Infect seems to be seeing a bit of a revival at the moment but is definitely worse that it was. The speed of the deck is definitely a concern, as is our lack of removal. However, cards like Thalia can disrupt them and Ghost Quarter can deal with Inkmoth Nexus . Our fourth matchup is against Bant Company. As a creature-based deck some of our disruption doesn't work as well as it otherwise might. It is very possible for them to overwhelm the board which can make things tricky. We want to disrupt as much as possible and use cards like Flickerwisp to get through damage. Our fifth and final matchup is against UB Faeries. 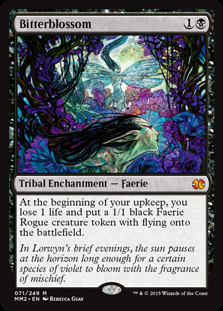 UB Faeries is not that popular a deck but one that throws up a few problems for our deck. Bitterblossom can be particularly punishing and makes Flickerwisp much less effective as an attacker. There are a lot of different variations on the Eldrazi & Taxes deck. The version I picked was particularly Eldrazi heavy with the Reality Smasher top-end. The latest variant appears to favour running Dark Confidant as a way of gaining card advantage. It is a bit risky with cards like Thought-Knot Seer in the deck and the high number of 3 drops but seems worth testing. As far as Eldrazi & Taxes goes, I can see why it is a better and more powerful version of the original Death & Taxes decks. The powerful Eldrazi creatures add a lot to the deck alongside the power of Eldrazi Temple . Eldrazi Displacer is particularly impressive as a way of getting to repeatedly use your ETB effects. However, in general I found the deck a little awkward. 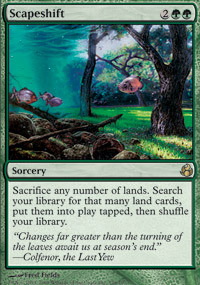 In the right matchups your disruptive creatures cause your opponents lot of problems and give you a sizable advantage. However, when the matchups don't line up or your draw the wrong disruptive creatures things can be tricky and you feel like you are playing with underpowered pieces. There are a lot of synergies as well that are less impressive uncombined. 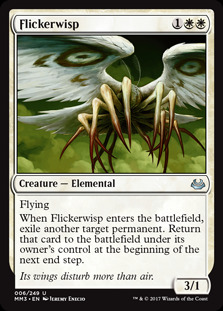 For instance, Flickerwisp is a lot less impressive when not played at instant-speed. The deck is good and much better against unfair decks in the format rather than the fair decks. Depending on the metagame, Eldrazi & Taxes can be very good but as I say it can feel underpowered depending on your matchups.